More than half of American adults want to lose weight, and this goal has given birth to the multi-billion dollar fad diet and weight loss industry we see today. These diets go beyond drastic calorie cutting to subjecting dieters to trends that have them taking in nothing but cabbage soup; ditching carbs entirely; or banishing solid foods for liquids. Since it’s hard to know which diets are actually healthy and which are pure marketing, Ted-Ed provides a few key clues to spot a fad. Diets that require intensely cutting calories or altogether removing an entire food or food group are usually just fads. They promise a set of tricks, tips, and secrets said to yield dramatic weight loss results. Same goes for diets that instruct followers to incorporate one particular food into the diet, like a grapefruit at every meal, or to replace meals with shakes or protein bars. There isn’t a magic food you can eat to lose weight. If it sounds too good to be true, it probably is. 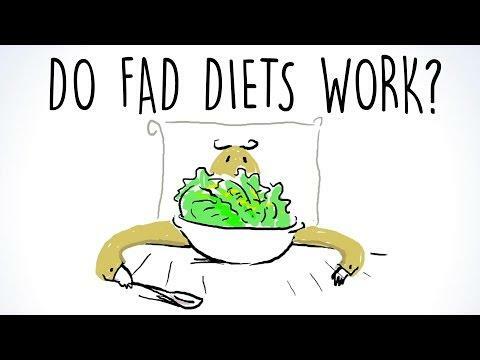 Not only do fad diets fail to work over the long term, they can also be dangerous; this is especially true of those that call for severely restricting caloric intake. The bottom line is: Fad diets tend to fail. They promise results, which may come immediately after cutting carbs or calories, but they will eventually become unsustainable. It’s not possible, for example, to healthily sustain the body on nothing but cabbage soup or liquid in the long run. Losing weight from drastic diet measures only to gain it back then lose it all over again becomes a vicious cycle known as yo-yo dieting among repeat fad dieters, whose metabolisms are likely to slow down while their frustration levels soar. It’s better to turn to balanced diet plans, which feature a variety of foods from all food groups. In many cases, a weight loss method based on practicing portion control, taking time to prepare healthy meals ahead of time, willpower, and drinking plenty of water is best for staving off hunger, food cravings, and weight gain.